Brighton Dental has a solutions that is minimally invasive, one visit dentures that stay in place and don’t hurt. Now there is a dependable and inexpensive procedure for those with lower dentures to have the comfort and confidence to improve the quality of their lives, without expensive or painful surgery. With the Implant Supported Dentures Procedure from Brighton Dental, millions of dental patients who are dealing with the pain and embarrassment that can be caused by ill-fitting dentures can now get the latest Brighton narrow-body implants for much less than traditional implants, close to their homes. The following will provide you with helpful information about the procedure, answers to some of the most frequently asked questions about the procedure, interesting facts about how the procedure can improve your health and your life, and testimonials from other patients about their experiences with their new Brighton implants. Gordon J. Christensen, DDS, MSD, PhD, who co-founded and consults for the highly respected Clinical Research Associates (CRA) Foundation and founded and directs Practical Clinical Courses (PCC), estimates that about 9 out of 10 people with lower dentures are unhappy with them. This dissatisfaction stems from poor fit caused by insufficient bone. On the other hand, most people who have upper dentures are happy with them. He say many of those who are dissatisfied with their lower dentures could be helped with more traditional implants, which are about 4 mm or larger. Traditional implants, however, are more invasive and expensive, with a longer recovery and more pain. Implant supported dentures from Brighton Dental were developed to be a less invasive and more affordable alternative to traditional, larger implants. With this procedures, there are no surgical incisions and no stitches, both of which are necessary for traditional implant, and can be placed in a dentist’s office in under an hour with only local anesthesia. Even better, you will walk out of your dentist’s office wearing your refitted dentures immediately. Traditional implants can cost upwards of $7,000, but you can get Brighton dental implants for as little as $2,500 when we use your existing dentures. Some people have been turned down for traditional implants because they have a narrow bony ridge. 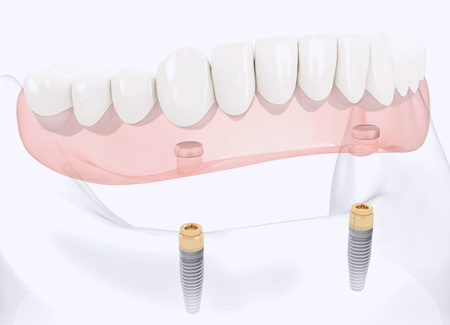 Brighton dental implants, however, are only 2.2 - 2.4 mm and are perfectly designed for these patients. Most patients who have been unable to get traditional implants for this reason can benefit from these smaller and less invasive implants. “Many fully edentulous [completely toothless] patients wearing full dentures are retired and living on a fixed income, or they are low level income earners; in other words, the working poor,” explains Dennis P. Tarnow, DDS, professor and chairman of the department of implant dentistry at New York University College of Dentistry. Implant Supported Dentures Procedure from Brighton Dental “is ideal for these patients because of the lower expense involved and its non-invasive nature. It will help stop the bone loss in the jaw, prevent the pounding of the ridge by the denture, and overall save these people from becoming denture cripples.” Nels Ewoldsen, DDS, MSD, a clinical researcher for DENTSPLY Prosthetics, says implants used to hold lower dentures in place may be able to help preserve bone. Bone preservation is becoming ever more important as more people wear dentures, and as those denture wearers age. “It is generally known, particularly in females, that bone mass lessens with age,” Ewoldsen says. “It decreases remarkably in the edentulous lower jaw, so if we can place implants here and preserve some bone, these people are going to be better off.” The procedure involves placing four narrow titanium implants, typically near the front of the jaw. Then a silicone material is used to reline the denture so that it fits securely around the implants, allowing the denture to be held firmly in place. This provides a comfortable fit with optimal hold, using a less invasive and less costly procedure. Stories like these are becoming ever more common across the country as denture wearers of all ages find new confidence, comfort and a renewed ability to talk and chew with implant stabilized dentures after the procedure. 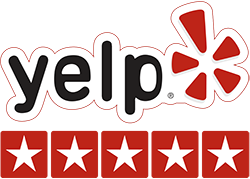 Steven Lynn, DDS, has a private family dental practice in Bloomington, Indiana. He recalls the first time a patient hugged him after he was able to restore her ability to function normally and smile with confidence. Lynn remembers the woman was older, had had problems with her dentures for several years, and was unable to afford traditional implant. Since having the procedure, she is quite happy with her new, properly fitting and secure dentures. “The hardest part for me is assuring patients that this procedure will work because other dentists they may have seen don’t know about it or aren’t offering it,” Lynn admits. “But when you know you have helped your patients—when you see how miserable they’ve been from wearing dentures that don’t fit—and you can offer them this affordable, effective way to regain their comfort and confidence, it’s just marvelous.” Lynn had worked with other types of implants, but was looking for something that would be more affordable for his patients. This procedure, he says, offers a reasonably effective and affordable way to give his patients a stable platform for their lower dentures that allows them to live normally. As a dentist offering the procedure, he says it is easy to perform after going through the training course. To find out if this solution is the best option for you, call for a Free consultation with Dr. Paige Woods, DDS - (619) 640-5100.